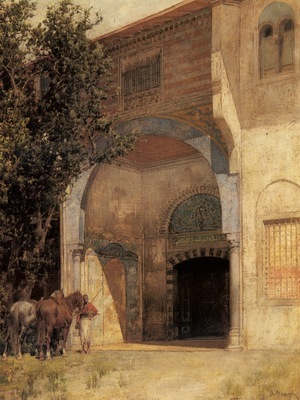 Author name: Alberto Pasini . (1826-1899). By the 1880's Alberto Pasini had achieved the peak of his artistic career and we see a refined level of maturity in his work. The culmination of experience from his many adventurous expeditions to the Orient and Mediterranean combined with his technical skills brings his painting to the level of virtuosismo. This seminal work from the oeuvre of Alberto Pasini reflects the discerning taste of its illustrious provenance.